Toothbrush Features Integrated Fountain-Making Tunnel | OhGizmo! By David Ponce on 06/08/12 • Leave a comment! Brushing teeth involves rinsing them, and while there’s plenty of ways to get that water into your mouth, very few are as elegant as this. 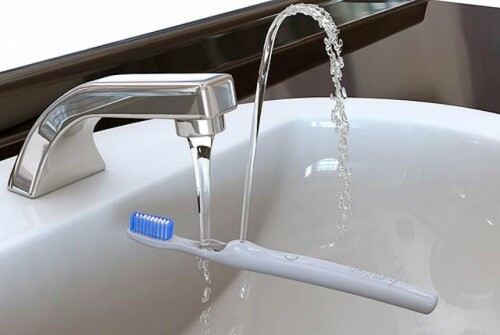 It’s a toothbrush that features a specially shaped tunnel and spout that redirects the flow of water and creates a fountain when placed under the tap. Then just drink from that to rinse. It’s genius. And it’s not new: Andrew wrote about this in 2007. But that brush was never really available and the prototypes cost as much as a black market kidney. The Rinser Toothbrush by Amron (as it’s called) is $22 on presale, $35 usually. November delivery.